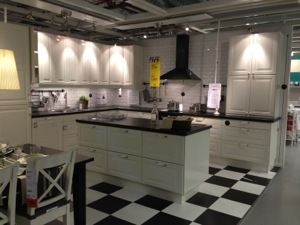 When we walked around the store yesterday I found my dream kitchen. Lots of space for cooking/baking as well as for storage and display of finer china. Also an island which I love, but I would make it even better with adding a few high chairs so you can sit and eat there. Having a space so we can have dinner parties easier is also a major plus! 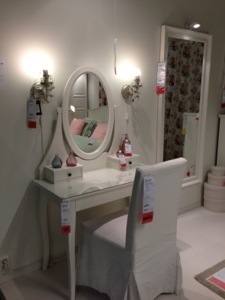 I also found a make up table which I would love to have when we have a bigger bed room one day. Oh and not to forget a his and hers sink in the bath room. I loved having that when we lived in the US. Haha Is Ikea in Sweden like it is here in Australia – they let you in and then you have to walk the ENTIRE STORE in a maze like way until you get to the exit? The cafeteria is located halfway through the maze so you can get some much needed sustenence. 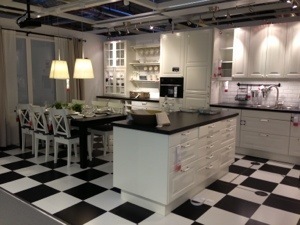 I do like some of the Ikea stuff. It’s pretty funky. I think it’s funny that you shopped at Ikea in it’s natural form, so to speak – in that you are in Sweden and Ikea is from Sweden. You would make sense of all those funny names they give things, whereas to us, it sounds a bit like they make it up as they go along. lol. xo and YES! That kitchen is GORGEOUS! 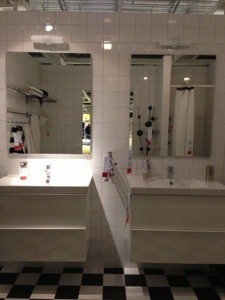 Yes, I think every IKEA is like that. The stores in the US was the same way. Bad for the wallet but pretty good for exercise as you walk a lot. If I know what I want before going there i check the shelf number and just go directly and pick up my items. Much quicker to get to the cashier then!